toybot studios: Lucky Nakazawa Drunken Master Issue 12, Hanya Print and T-Shirt Available NOW..!!! Lucky Nakazawa Drunken Master Issue 12, Hanya Print and T-Shirt Available NOW..!!! WTF? Interview with Josh Barnett? Reason enough to buy...!! DRUNKEN MASTER ISSUE 12 IS AT THE PRINTERS. - Interview with Mixed Martial Arts fighter and pro wrestler Josh Barnett. Yes, THEE JOSH BARNETT. - Comic-Con is huge so if you need help finding us you can triangulate our position by locating these easy to find land marks. Capcom, Warner Bros. and Tokidoki - we are in their Bermuda triangle. The cover art for DM12 was originally commissioned for Josh Barnett's 'The Sun Forever Rising' heavy metal benefit for Japan show. A limited edition of 59 prints was made sans any text or graphics. 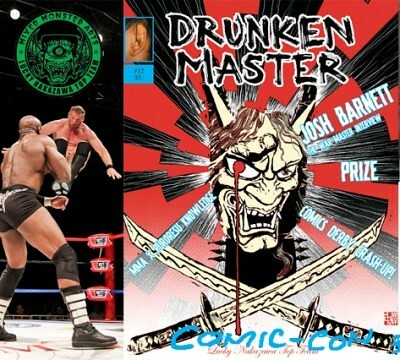 - signed by Josh Barnett and myself. 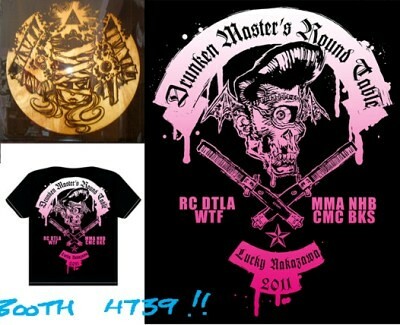 I am now taking pre orders for the new Drunken Master's round Table t-shirt. If you ever came in on one of my Sundays at Royal Clayton's Thank you. Many of you lived to far away to visit but were honorary members of the round Table by virtue of your good taste in comics, music, movies, MMA, wrasslin' and good times. This t-shirt commemorates the era of the Round Table before the down town LA pub closed it's doors. White and pink on black short sleeve t-shirts. Pre order now, I don't know if or when a reprint will happen and some of you have cried tears of sadness when you found out I was sold out of a design or ran out of your size. Your crying breaks my heart so let's avoid that whole mess. Your support is truly appreciated and every sale helps. - All pre-orders will be shipped end of July. Order Drunken Master #12, the Metal Hanya print and a t-shirt all for $45.!!! - ideal gift even for those on a low carb diet. Thanks for keeping up on my news and for being yourself.